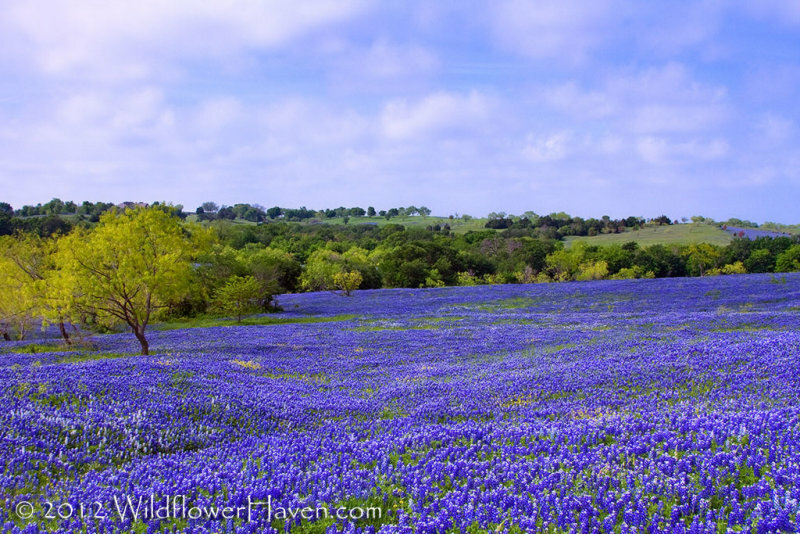 Most of the prime wildflower photography in the Ennis area is bluebonnets with rolling hills. You also can find fields of Texas paintbrush. And there are a few back roads with a variety of wildflowers. There is a mixture of the country estates that might have horses and some livestock, a few ranches, and some farms. The main published routes are along paved roads some like Texas 34 are very busy with few places to safely pull over. There ...are roads that are more rural and quieter like Andrews RD and Mach RD. Some of the roads are rough dirt roads and a number of the rural ones have low water crossings that can flood. One of the big challenges in the Ennis area is that many of the prime roads for large fields do not run completely north and south. This makes it tough to get a true sunset or sunrise. However, with a good broken cloud cover, often you get a part of the sky to light up with nice color. This is true of the famous Mach RD field. Also because the fields will often slope down without a rise on the horizon it is also tough to get that hyperfocal distance point (where the near and distance objects are mostly in focus). Image stacking with different focal points can overcome this. The soils in the Ennis areas are a mixture of sandy loam to dark clays. What makes some of the displays dramatic is the rolling hill topography. Why? Well, bluebonnet seeds are small, but not designed to be carried very far by wind. So where there is sloping hilly topography the seeds tend to get carried down that slope by rainwater. The sloping topography tends to drain better than the flat fields. There are some relatively flat fields in the Ennis area and sometimes in a really rainy season those fields will not do well because of the poor drainage. So what is the trick to finding that good topography for bluebonnets without having to travel all the roads looking for them? Read the Ennis Sunsets and Sunrise post for the answer!